I adore Banana Foster more than words can say so it made total sense to me to carry this flavour profile into banana bread. I mean what is not to like about brown sugar caramelised bananas in buttery rum. I searched the Internet high and low and found a plethora of banana bread recipes all claiming to be the best-ever. I think I was trying to find some holy grail of banana bread. What I did find was many with fruit, nuts, chocolate and spice and many sounded delicious, but in the end I settled on my favourite banana bread recipe because better the devil you know. I like my bread to be very banana-ey. So I added an extra one to my recipe, but next time I’m going to see how far I can take the banana addition vibe and add another 2 or maybe 3. I just think sometimes you have to live on the edge and YOLO. I’m not a fan of adding things like cinnamon to my BB – although once I did add chooclate and blueberries which was quite nice. I can just never seem to make my banana bread banana enough. I had also been very clever and frozen a whole lot of bananas that were about to turn a while ago, so I had them right on hand and in perfect gooey condition for banana bread. This is one of the best tips I picked up on the interwebs. They seem to lose a fair amount of liquid as they thaw, but when you peel the black skin off, out pops what looks like a baked banana that is perfect to use in baking. Or in butter, but we will get to that in a bit. I left out the walnuts even though I love them in banana bread and then I took it next level. With two very limp and sad thawed frozen bananas remaining I decided to ‘Foster’ them up and see if I could make a whipped butter. It was ridiculously delicious. I feel proud as I feel like I’ve invited something new. I haven’t Googled to see if anyone else has done this yet, because I don’t wont to ruin my proud moment. If you don’t want to stray from your favourite banana bread recipe – as I know a lot of people wont, I can highly recommend making this Banana Foster butter to spread on it. 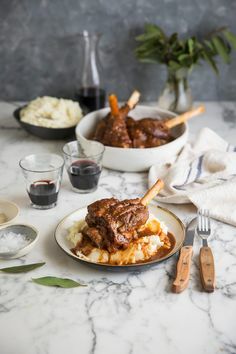 ~Cooks notes – I love muscavado or demarara sugar here. It just adds to the caramel profile. You could of course use any sugar. It’s important to flambé the rum so as to burn the harsh alcohol off leaving behind the delicious deep flavour. I love to use Captain Morgan Spiced Rum in my dessert baking as it imparts great taste. White rum would be a waste of time here. Oh, and please let me know if you have the worlds greatest banana bread recipe passed down from a grandmother (or not). Add the rum and ignite to flambé. This will burn the alcohol off. Set aside to cool to room temperature. Using an electric mixer cream the remaining ½ cup sugar with the 2 eggs until pale and fluffy and doubled in volume. Add the vanilla extract. Add the banana mixture and stir by hand to combine. Sift the flour and baking powder into the bowl and by hand mix this into the batter. Empty the banana bread batter into a loaf tin that has been lined with baking paper (I always like to line the loaf tin with paper as this helps to prevent over browning of the outer part of the loaf which can happen when you are baking a loaf or a bread for a long period of time). Bake for 70 – 80 minutes (depending how thick your loaf tin is) and until golden brown and springy to the touch. I also always insert a sharp knife into the thickest part of the loaf and ensure that it comes out clean. * To prevent the top from over browning I loosely cover with a piece of tin foil from about 35 minutes into the baking time. Melt the butter in a pan. Add the sugar and banana and mix until the sugar has dissolved and everything is golden brown. Add the rum, flame this and then continue to mix until all the sugar is 100% incorporated. Set aside to cool in the fridge. Whip with an electric mixer and then add the additional room temperature butter to taste. Whip until you have a smooth and spreadable consistency. The banana bread looks so good! need to bake one soon again!